While termites may provide some benefit to the ecosystem by adding nutrients to the soil, they can create havoc in wooden structures, including your home. Their need to feed on wood can lead to significant structural problems, causing homes to become inhabitable. You could be the unknowing host of this destructive insect if you have found mud-like trails within your home. Termites can burrow through wood, creating a cavity in which they can live. Sometimes holes are formed in the layer of wood covering the cavity. The termites cover these holes with a mud-like material containing soil, saliva and feces. Swarms of flying insects around light sources can be an indication of a nearby termite nest. Swarms are groups of adult termites that leave the nest to build new colonies. This activity occurs when the existing colony gets too large. Swarming generally takes place during the spring and the fall months. The adult termites come out during daylight hours, particularly just after it rains on warm days. Swarming termites shed their wings when they are active. A pile of wings in your home is a sign of a termite problem. Some types of termites live in the ground and create mud tubes that connect their habitat to their food source. Subterranean termites build these types of tubes from mud and waste. If you find mud tunnels in your home, you most likely have a termite infestation. You can crack open a tube to see whether there are any live termites within it. Adult reproductive termites have wings, are brown or black in color and are approximately�a half-inch in length. 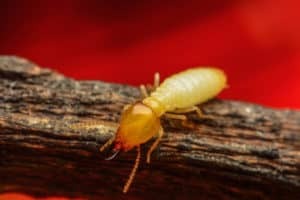 Worker termites do not have wings, are white in color and are about a quarter of an inch long. If you have found this type of insect in your home, there’s a chance you could have a termite issue. Wood that appears to have crushing damage at bearing points is indicative of termite activity. Termites burrow into wood to create their homes. Tap an area in question: a hollow sound is indicative of termites taking up residence in the wood. If possible, pick at the surface with a sharp tool to see if there are any tunnels running in the same directions as the wood grain. The destruction created by termites can sometimes look like water damage. You may see wood that appears to be buckling, floors or ceiling that are swollen and other areas that appear to have minor water damage. These signs are sometimes accompanied�by the odor of mold or mildew. If you are in need of termite pest control in the Frisco, TX, area, contact the experts at Safe Pro Pest. Call (972) 435-0700 today! Locations we service for pest control Plano TX, Frisco Texas, McKinney, Allen,Celina, Prosper, Fairview, Little Elm, Lucas, Oak Point, Paloma Creek and Savannah. Give us a call and we'll solve all of your extermination needs including rats, rodents, termites and mosquitoes.